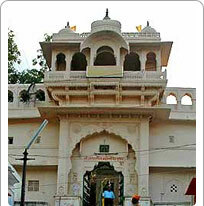 The only Brahma temple in the world is located in Pushkar, a mere thirteen kilometres from Ajmer. Built in the fourteenth century, the temple has marble steps leading up to it. A beautifully carved silver turtle on the floor faces the sanctorum of the temple. The marble floor around the silver turtle is embedded with countless silver coins, with pilgrims name engraved on them.